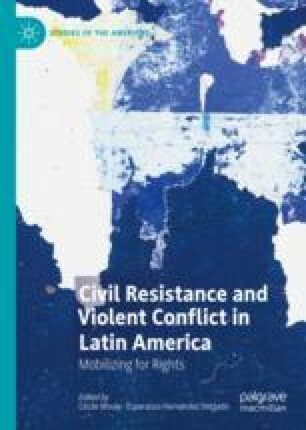 This chapter analyses the civil resistance campaign of the Roofless Workers’ Movement (MTST) for the right to housing in the periphery of large cities of Brazil. It explains how this social movement of workers used direct action, including land occupations and political actions, to achieve its objectives. Irrespective of the political parties in power, the movement mobilized against the state and private companies to denounce the violation of the right to decent housing, from which many Brazilians who live in the suburbs of cities have been deprived, and press for an effective urban reform. Without knowing much about civil resistance, its members adopted many of its principles in their nonviolent struggle for the recognition of the constitutional right to housing. What is the use of a house if it does not have a tolerable planet to sit on? Freitas, Carolina. 2017. Brasil: 20 años del MTST: un hormiguero contra el neoliberalismo. Retrieved from: http://www.resumenlatinoamericano.org/2017/12/18/brasil-20-anos-del-mtst-un-hormiguero-contra-el-neoliberalismo/ (accessed February 20, 2018). MTST. 2005. As linhas políticas do MTST [The political lines of MTST]. Retrieved from: http://www.mtst.org/quem-somos/as-linhas-politicas-do-mtst/ (accessed January 10, 2018).